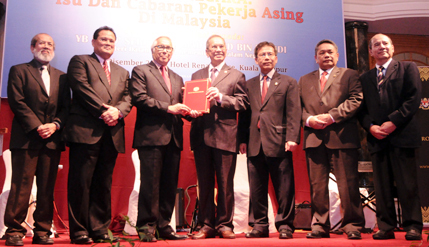 KUALA LUMPUR, 16 December 2014 – The National Professors Council (MPN) has proposed that the Employment (Amended) Act 2012 be reviewed to cover the rights of foreign workers, as they are an important contributor to the nation’s economy. The council’s deputy secretary-general, Prof Dr Kamaruddin M Said, said Malaysia will continue to rely on foreign labour – especially in labour intensive sectors – for quite some time to come and it is high time they are accorded fair treatment. Speaking after MPN’s conference on foreign workers: The Nation’s Dilemma Issues and Challenges of Migrant Workers in Malaysia, here today, Prof Kamaruddin said Malaysia should enter into direct government-to-government arrangements with all countries that supply workers to Malaysia to shield the workers from exploitation. “We have (an estimated) 6 million foreign workers. That is not a small number. We should get them protected by the Employment Act,” said Prof Kamaruddin, the former UKM Publications Director, at a news conference. Police figures cited in an earlier presentation showed there are around 2.9 million legal foreign workers registered in Malaysia. Prof Kamaruddin said Malaysia must come to terms with the fact that it will continue to rely on foreign labour to keep its industries running, as there are just not enough Malaysians to fill in the millions of jobs available. Of the country’s 30 million citizens, seven million are still in school and there are an estimated 13 million new job openings in various sectors ranging from agriculture to manufacturing. “This means we must make sure foreign workers are treated well… we propose that we should change the term to guest workers, because legal foreign workers bring a very positive effect to our country,” he said. Prof Kamaruddin said Putrajaya needed to revamp the existing system relying on employment agencies which imposed high fees to bring in foreign workers resulting in many of them being deep in debt even before starting work.